Washington meddlers are already on the ground and in our schools gathering intimate data on children and families. Earlier this year, revelations about the Department of Justice spying on the Associated Press were quickly followed by revelations that the NSA was collecting phone data on all Verizon, and then all American cell phone, users. Edward Snowden’s whistleblowing drew yet more attention to the issue, and domestic surveillance programs have remained a top issue in people’s minds ever since. While Americans focus on institutions like the CIA and NSA, though, programs are being implemented which would lead to a much more institutional way of tracking citizens. 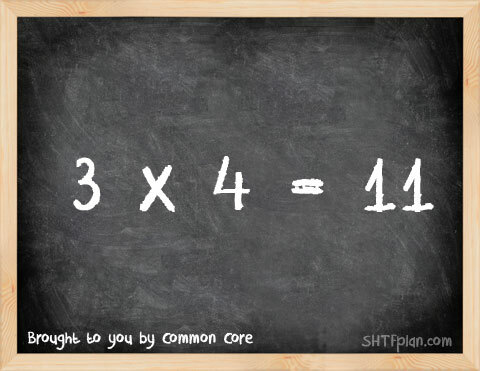 Obamacare is one of these, but Common Core Standards – the federal educational program – is the most eyebrow-raising. 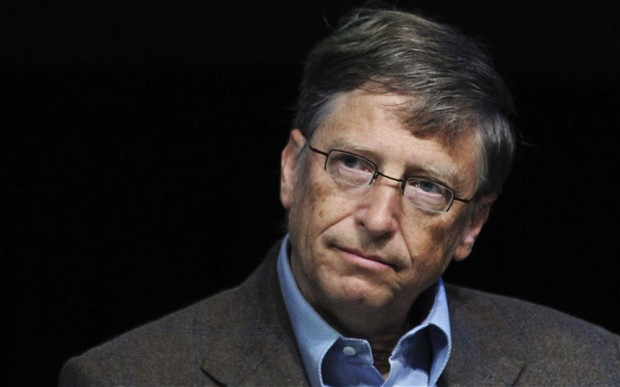 Bill Gates was one of the leaders of Common Core, putting his personal money into its development, implementation and promotion”, so it’s unsurprising that much of this data mining will occur via Microsoft’s Cloud system. Even the Department of Education, admits that privacy is a concern, and that that some of the data gathered may be “of a sensitive nature.” The information collected will be more than sensitive; much of it will also be completely unrelated to education. Data collected will not only include grades, test scores, name, date of birth and social security number, it will also include parents’ political affiliations, children’s health records and blood types, individual or familial mental or psychological problems, beliefs, religious practices and income. NSA data mining is troubling because it could lead to intensely negative outcomes, because it opens up new avenues for control, and because it is fundamentally wrong. Common Core data mining, tracking students with GPS devices and RFID chips, however, is far, far scarier. It gives the government the ability to completely control the futures of every student of public education, and that will soon extend to private and home schools. It provides a way to intimidate students – who already have a difficult time socially – into conforming to norms which are not only social, but also political and cultural. Read more HERE at Benswann.com. 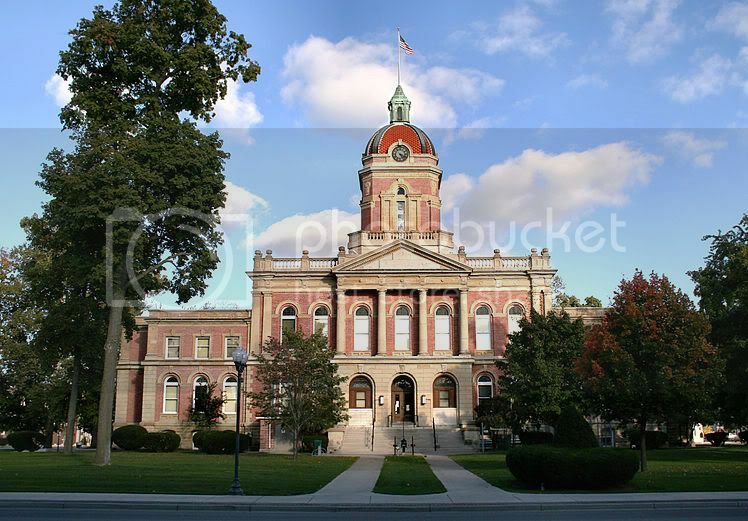 Is ‘THIS’ the Kind of Education We Want in Elkhart County? Earlier this year President Obama detailed his new educational initiatives aimed at “closing America’s school readiness gap.” As with all things Obama, it seems that “readiness” is yet another doublespeak term that suggests exactly the opposite of the traditional definition. At a recent school meeting in Grayslake, Illinois curriculum director, Amanda August discusses the new federally mandated Common Core education standards, which are currently being implemented into school districts across the nation. It’s no matter if a student comes to the conclusion that 3 x 4 = 11. So long as they can explain how they made this erroneous determination they go home with an ‘A’. One in four high schoolers think Columbus discovered the New World after 1750. On the multiple choice test, less than half of high school students knew when the Civil War was fought. They didn’t even need to know exact dates, just that it was sometime between 1850 and 1900. Only 60% of students knew that WWI was fought between 1900 and 1950 — they only had to guess the half century! 40% of students could not identify the name of the ocean on the eastern side of the United States. Nearly 60% of students could not identify the two major political parties. When asked who is in charge of the Executive Branch of the United States, 70% of high school students got the wrong answer. Fully 75% of high school students failed to identify the First President of the United States. Not convinced that implementing Common Core will “dumb down” our public schools? Watch the following video from Lunch Scholars, which asks typical American high school students to answer a series of common questions covering topics such as American history, geography, and politics. In which war did our country win its independence? Which countries border the U.S.? How many stars on the flag of the United States? Can you name a country starting with the letter “U” ? THE IMPLEMENTERS OF COMMON CORE TOLD THOSE PARENTS: “Because the FCAT 2.0 is based on more demanding content standards and the achievement standards are more rigorous, scores may appear lower on the new scale than on the previous scale for certain grades and subjects. Read the question and answer sheet put out by Florida Common Core educators for concerned parents HERE. So…according to the Common Core educators in Florida, expecting your child to KNOW THE NAMES OF THE TWO MAJOR POLITICAL PARTIES IN THE THE UNITED STATES is too rigorous and demanding for children educated under Common Core to master in a couple of years?! Common Core’s Question and Answer Sheet, in my opinion, “talked down” to valid parental concerns. “Trust us.” That has worked out so well so far. What could possibly go wrong? The Debate Raging Over Common Core is Enough to Make One’s Head Spin! The debate raging in Indiana over the implementation of Common Core is enough to make one’s head spin! Republicans have always promoted smaller government and local control. Common Core offers neither. 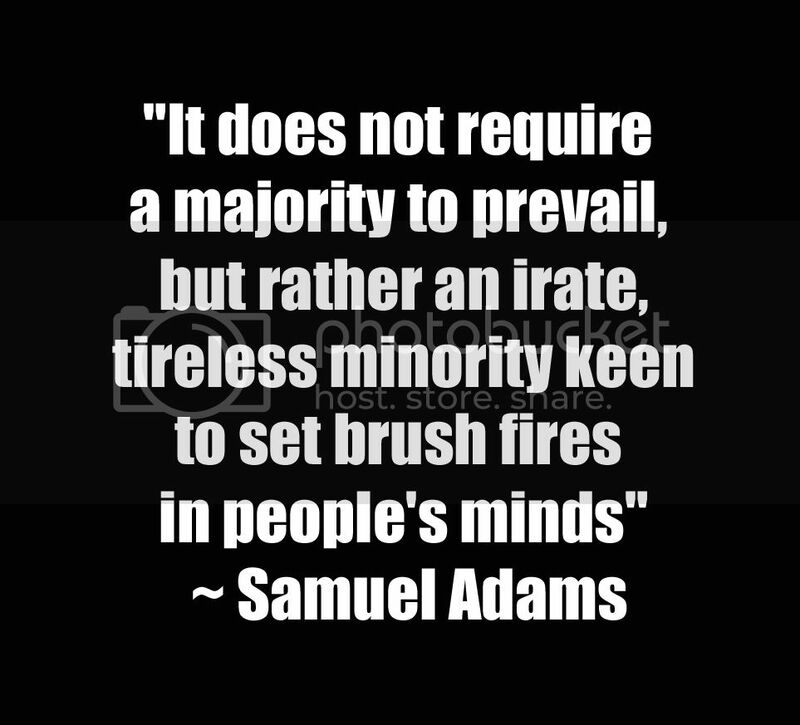 Democrats have historically promoted social equality and equal access. Common Core offers neither. 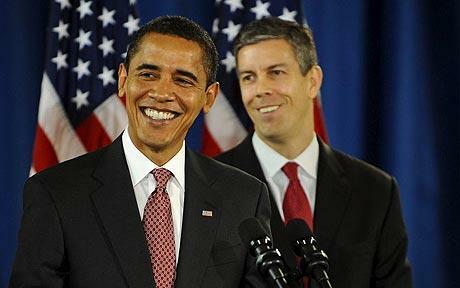 President Barack Obama and Arne Duncan, Secretary of Education, announce Race-to-the-Top, an education reform backed by historic levels of financial support — $4.35 billion in discretionary funds. One could understand that cash-strapped states had no choice but to try to win Education Secretary Arne Duncan’s Race-to-the-Top, with the funds promised to pour into state education coffers upon successfully agreeing to all of its stipulations. But that does not account for the relish and rigor with which Republicans Daniels and Tony Bennet, Indiana School Superintendent, (and their Doppelgangers in other states) embraced Common Core. Tony Bennett was literally salivating at the prospect of winning a spot in Race-to-the-Top. He demanded that the Indiana State Teacher’s Association immediately support five key principles of Indiana’s Race-to-the-Top application which created a highly public feud between Bennett and Indiana’s teachers’ unions. Bennett and Daniels, as well as the other Republican governors across the country, broke from traditional Republican ideology to accept Common Core which an article in The New American magazine, “Common Core: A Scheme to Rewrite Education” describes as “being foisted on state governments all across the country with a combination of taxpayer-funded bribes and outright deception”. Another article by Ann Kline in American Thinker titled “Everything You Wanted to Ask About Common Core and More”, explains how Common Core utilizes intrusive student data-mining and that the educational reformers pushing Common Core, including both Democrats and Republicans — thank you, Jeb Bush — are lying when they say that the standards are state-based, state-led, and voluntary. In this article, Kline speaks of Lieutenant Governor Dan Forest of North Carolina. Mr. Forest wrote well-researched questions about Common Core to his state’s Department of Public Instruction….200 of them! (Read Lt. Governor’s letter to the North Carolina Department of Education, HERE.) Lt. Governor Forest also questioned the premise of Common Core at a press conference. Then, there is Glenn Beck’s coming out against Common Core on his radio program, his television program and in his writings. So, why are we labeled “Conspiracy Theorists” because we believe there are selfish, power-grabbing, and, most likely, financial reasons that Common Core is being pushed upon us? Should local education be turned over to the feds? Mr. Bennett has a big choice. He either steps this monster back and lets the legislature and the people we elected to represent us to VOTE on adopting common core, or he faces an election issue and the wrath of Hoosier moms. The TEA Party has caught on to this federal takeover of our education system and how quickly Indiana adopted these standards with most of us unaware. We are moms and dads who have children in the system and we refuse to let the state of Indiana hand them over to the Federal Government. 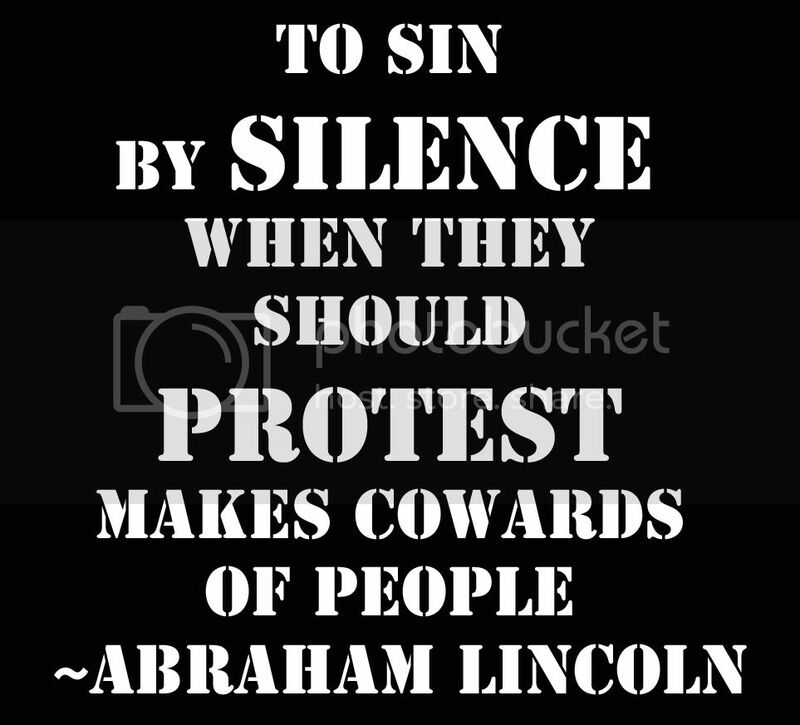 We refuse to let them become public experiments. I call on Tony Bennett to rescind the adoption of the Common Core standards and BRING BACK CONTROL TO OUR TEACHERS AND COMMUNITIES. If he does this, he has our full support. Not everyone is happy with Common Core–even as a project of the states. It is being criticized as potentially very expensive and likely to impede achievement by creating a “race to the middle”. Many of the standards Indiana gave up, for example, are tougher than the ones in Common Core. A single set of standards, whether voluntarily adopted by states or arbitrarily imposed by the federal government, suffers from the effect of centralization, which stifles innovation and risks the “universal mistake” phenomenon. Professors at Stanford, New York University, and the University of Pennsylvania agree that the Standards are not comparable to those of other high-achieving countries. Is Common Core a Socialist Program? 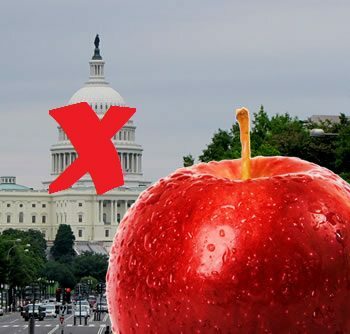 If you don’t want the federal government in charge of YOUR child’s education, here is the petition to -> ‘Stop the implementation of the Common Core Standards in Indiana’. Join the movement! SIGN NOW! Central to the meaning of socialism is common ownership of resources, free access to services/goods, and little or no personal property ownership. Common Core is a national movement toward a single, collective set of common academic standards, common access to the academic standards and tests, and little or no unique or diverse education nationally; so yes, it’s a socialist program. Upon acceptance, it forced top level states’ standards down, and forced low-level states’ standards up, to a middling standard that is mediocre at best: it’s common. Common Core has even changed the definition of “college ready” to something more common; it now means anything from 4-year to 2-year, to vocational school-ready. And Common Core has been adopted by each of the United States, except Texas and Virginia. And, is socialism essentially the same thing as collectivism and communism?